Near the Ringling Art Museum and the airport, this is an opportunity to run on some pleasant roads, incorporating some interesting Sarasota sites and lovely homes. Our main route is along banyan tree-lined Bay Shore Rd. 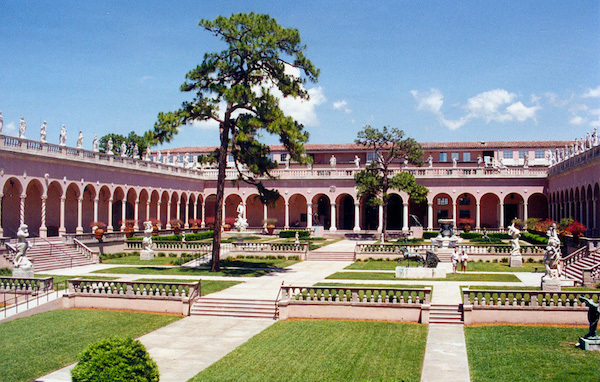 which runs for nearly 3 well-shaded miles from the Ringling Museum and the New College of Florida, to Indian Beach. There’s also some lovely running on the grounds of the museum. You’ll then do a loop along N. Shore Rd. and S. Shore Rd., to Sapphire Shores Park, then along Bayshore Rd. again, to 40th St. near the Sarasota Jungle Gardens, and then another mile or so to Indian Beach. There are some interesting sights along this route: the Ringling Museum of Art, which has 31 galleries in a pink, Renaissance style palace; the palazzo-like Ca’ d’Zan, once home to the Ringlings; the Tibbals Learning Center, which contains Ringling Circus archives; the Sarasota Classic Car Museum, and the Sarasota Jungle Gardens, which features more than 150 animals & shows in a tropical setting. For variety or add-ons, there are a few dead-end streets that run off Bayshore Rd. toward the water.